International Women’s Day is celebrated across the world on March 8 each year. It is “a day when women are recognized for their achievements without regard to divisions, whether national, ethnic, linguistic, cultural, economic or political” (United Nations). 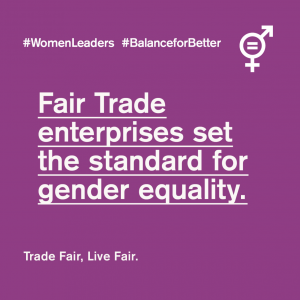 Throughout the year, fair trade enterprises champion gender equality through women’s leadership and economic empowerment. Today, join us in celebrating women leaders in fair trade for International Women’s Day! When Juliana Mustapha began batiking for Global Mamas in 2005, she didn’t have a bank account or assets of her own and was living in a single room with her husband and three children. On her first visit to the Cape Coast office, she walked shyly in to pick up her first order, then walked quietly out after completing delivery of the finished fabric. After 14 years with Global Mamas, Julie now bursts into the office: greeting everyone with a brilliant smile, making jokes, and persuading staff to increase her orders as she takes on yet another full-time employee and apprentice. She has emerged as a leader within the organization and speaks up at roundtable meetings, offering opinions on Global Mamas pay incentives, and suggesting topics for capacity building. During her time as a Mama she has trained five employees in batik making, one of which has started her own small business and is now working directly with Global Mamas. Over the years she’s purchased two plots of land and built a house for herself and her mother. What might be her proudest accomplishment of all, however, has been putting all three of her children through university, and her daughter graduated last year with a degree in biochemical engineering. It’s hard to fully convey in words what it is to witness a woman claiming her power, but after 16 years developing long-term relationships with the Mamas in Ghana, we’re lucky to have witnessed many women finding their confidence and raising their voice! Munira Akilova of Tajikistan began her career as an economics professor. When she became very ill, her embroidery was the only thing that made her want to go on living. When she recovered, she joined the team at Armughon Handicrafts. She traveled to the remote mountain villages of the Zerafshan Valley of northern Tajikistan to search out the grandmas, collecting the stories and photos of the traditional textile patterns and ornaments of the region. She is now the handicrafts manager and designer for Armughon, one of the acknowledged artisan “Masters” of Tajikistan, with numerous regional, national and international awards. She works with 25+ women from several mountain villages, producing modern products that preserve the authentic designs and techniques of the ancient Silk Road, while creating desperately needed cash income and self-respect for the women of this impoverished region. A born teacher, she is also a sought-after teacher for master classes for artisans around the country. Her dream is to organize a school for traditional crafts associated with a high school in the mountains of northern Tajikistan, to preserve the traditional crafts and to provide new economic opportunities where none exist. Learn more from FTF member Hoonarts Fair Trade. Representing a new generation of gourd artists, Lizzet Hurtado chose to continue her family’s art tradition. After marrying her husband Rodolfo, the young couple started their own workshop. Lizzet found it challenging to make her way into the world of gourd art – even when coming from a well known artist family. She signed up to participate in a government run training program where she wound up being the only woman. There, she felt ostracized and verbally assaulted by the older male artists. She was unable to stay in that hostile environment. This crushed her, but she walked away with determination and promised herself that she would make it on her own. Right after that, Lizzet found out that her workshop had been granted a surprise loan through Lucuma Designs. And at that moment, Lizzet and her team took it as an opportunity to just push forward. With self-confidence, she has gained new leadership skills to guide her team. Lizzet continues to fight for equality for women – especially so that her daughter can grow up in a more positive atmosphere. As a fair trade small business owner of FTF member Mango + Main, Shannon Riesenfeld has been humbled to have the chance to work alongside women in Rwanda, Haiti and Peru who are rising leaders in their communities. These women are using the skills and resources that they have to intentionally craft a better future for their children. They’re entrepreneurs who gather other women together and encourage them to rise above their circumstances. Women in the U.S. have the unique opportunity to connect with our sisters in other countries and support their endeavors, simply by choosing to shop fair trade! Shannon loves sharing the work of her artisan friends with customers in Maryland and all over the United States. They have a desire to use their purchasing power for a greater good, and they’re searching for authentic, handmade products with a purpose. She finds joy in providing that connecting point between women across the globe! On February 9th, Rosa Chang, one of the founders of Blossom Inspirations, completed an impressive fundraising campaign by swimming 13.6 miles in the Pacific Ocean in Lima, Peru. It took her 6 hours and 16 minutes to finish it and at least 15,000 strokes! Through the fundraiser, Rosa collected USD $2,038 for Inspira shelter in Peru, which gives food and a home to kids getting treatment for and living with cancer, burns, and Down’s syndrome. The swimming campaign raised enough to ensure at least 15 days of food for these kids. This is a demonstration that through the sport and people’s love and compassion, we can make a better world. There is a treasure in our community – a woman who has spent decades working for the dignity of all human life, and it’s high time to celebrate her. Meet the vibrant Katherine Bissell Cordova, Executive Director of Chicago Fair Trade (CFT). Always on the move with boundless energy, connecting people, generating new ideas, turning ideas into plans and plans into action, Katherine makes community organizing happen and equally as important, she makes it fun. Consider CFT’s holiday pop-up shop, now in its fifth year and generating more than $160,000 in sales of fair trade products in one month. Did you know Katherine called over 80 landlords and real estate agents to find a suitable location? Did you know she cooks dinner for every CFT board meeting? Did you know that she helped start the first downtown fair trade shop in Chicago prior to joining CFT? Under her leadership, CFT has grown in leaps and bounds, increasing fair trade’s visibility in the community and impact worldwide. Little did Joyce Tannian know when she first began over 12 years ago the arduous task of learning how to provide easy access to clean water for rural Maasai people would lead to helping them in other ways. Originally, the women would beg Joyce for money to help them put their children through school. Joyce said no only because that would not be the answer in the short or long run, but what she did tell them is “I can buy your handicrafts and sell them in the US.” Since that time, they have become a powerful storytelling tool to the thousands who have heard Water is Life Kenya’s mission. Helping the artisans in Kenya with design, production, and marketing of their beaded handicrafts provides income, empowerment, and independence. In addition, profits from the handicrafts business fund clean water projects so more women can have opportunities rather than walk hours for water every day. Christine Kolisch had an early fascination with all things Asian so it was not surprising that a world wide adventure landed her in a Himalayan Kingdom when she was in her early 20s. She stayed for the next 13 years. To support the rich traditional crafts of Nepal, her company Cheppu from Himalaya was founded. Christine strongly believed and practiced the principles of fair trade before the term had been coined. The desire to give back to the country that had taught her so much, took the form of connecting students & sponsors and micro credits for farmer women wishing to switch from conventional to organic. But it was not until the devastating earthquake of 2015 that she was able to do good in a much bigger way. We Help Nepal reached thousands of people in immediate need of food, shelter and medicine, but moved from relief to sustainability. Today their projects have provided dental camps, solar power, clean drinking water, building schools and community centers, and computer facilities for remote mountain areas. Gary Zapata is one of Cielo Hammocks‘ heros in disguise. Beyond the attention to detail to our quality control process, she has devoted passion and dedication to turn our handmade products to meet international quality standards in markets like Japan, Europe, North America, etc. She’s single handedly done this by leading a group of all male artisans. This has positioned Cielo Hammocks as a market leader, promoting our Mayan culture across the globe. Josefina Urzaiz, co-owner of Cielo Hammocks, is a leader of leaders! She works toward empowering all women around her. She is a mentor and an example of how together we are stronger and that the only barrier between a girl and a dream is her mind.